The Diet of Worms 1521 (German: Reichstag zu Worms, [ˈʁaɪçstaːk tsuː ˈvɔɐms]) was an imperial diet (assembly) of the Holy Roman Empire held at the Heylshof Garden in Worms, then an Imperial Free City of the Empire. An imperial diet was a formal deliberative assembly of the whole Empire. This one is most memorable for the Edict of Worms (Wormser Edikt), which addressed Martin Luther and the effects of the Protestant Reformation. It was conducted from 28 January to 25 May 1521, with the Emperor Charles V presiding. In June of the previous year, 1520, Pope Leo X issued the Papal bull Exsurge Domine ("Arise, O Lord"), outlining forty-one purported errors found in Martin Luther's Ninety-five Theses and other writings related to or written by him. Luther was summoned by the emperor. 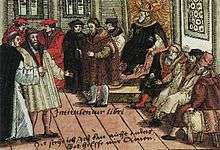 Prince Frederick III, Elector of Saxony obtained an agreement that if Luther appeared he would be promised safe passage to and from the meeting. This guarantee was essential after the treatment of Jan Huss, who was tried and executed at the Council of Constance in 1415 despite a promise of safe conduct. On 17 April, the imperial marshal, Ulrich von Pappenheim, and the herald, Caspar Sturm came for Luther. 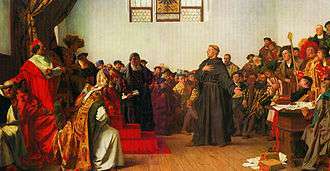 Pappenheim reminded Luther that he should speak only in answer to direct questions from the presiding officer, Johann Eck. Eck asked if a collection of books was Luther’s and if he was ready to revoke their heresies. Dr. Schurff said, "Please have the titles read." There were 25 of them, probably including The 95 Theses, Resolutions Concerning the 95 Theses, On the Papacy at Rome, Address to the Christian Nobility, The Babylonian Captivity of the Church, and On the Freedom of a Christian. Luther requested more time for a proper answer, so he was given until the next day at 4 p.m.
↑ Schaff, Philip (2015). History of the Christian Church. Arkrose Press. p. 145. ISBN 1346209650. 1 2 Oberman, Heiko, Luther: Man Between God and the Devil, New Haven: Yale University Press, 2006, ISBN 0-300-10313-1. ↑ Elesha Coffman. "'Hier Stehe Ich!'". ChristianityToday.com. ↑ Martin Luther. "Life of Luther (Luther by Martin Luther)". ↑ Noll, Mark A. (2000) . Turning Points: Decisive Moments in the History of Christianity. Grand Rapids, MI: Baker Academic. p. 160. ISBN 978-0-8010-1159-7. ↑ Graebner, Augustus Lawrence. "Outlines of Doctrinal Theology". Saint Louis, MO: Concordia Publishing House. p. 161. Retrieved 15 February 2012.